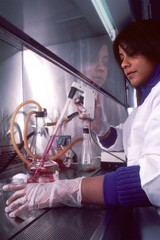 A female scientist is feeding living cells with media (red liquid) under a laminar flow hood. The old solution of cells and media are centrifuged with the cells remaining on the bottom. The old media is then removed and the new media is added. The laminar flow hood insures a sterile environment to prevent contamination of the cells.